The Australian aviation industry faces significant demands that present multiple challenges and opportunities to the management of air traffic in the foreseeable future. A carefully considered and well-planned approach is required to provide safe, secure, efficient and environmentally sound services. We must balance the challenges of traffic growth, technological advances, customer expectations, environmental considerations, and global air traffic management (ATM) developments. In preparing for the marked air traffic growth over the next decade, a substantial number of major infrastructure projects have commenced at airports in the Australian operating environment. While considerable capacity enhancements will be delivered through infrastructure development, capacity alone will not achieve the required outcomes to support our regional growth profile. “Doing more” must be complemented by “doing differently” to ensure successful growth profile management. The enterprise initiative of Future Airspace Management will provide the framework for an enhanced ATM operating environment and ensure that the needs of airports, airlines, the community and the environment are balanced to meet the challenges of growth in aviation. 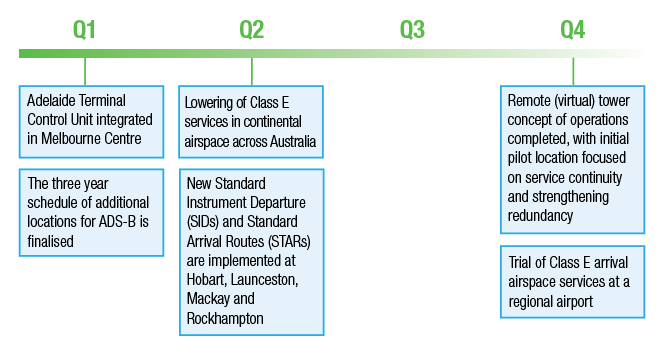 This initiative will provide value to our customers by helping to address the growing need for Australia to embark on a redesign of the manner in which aircraft arrive and depart in terminal airspace and the way they interconnect between busy city pairs as well as other regional and remote locations. Future Airspace Management premised upon future airspace system concepts will safely and efficiently accommodate forecast traffic growth. Over the next several years, a number of significant airport development projects will be undertaken, including the proposed implementation of parallel runways at Brisbane (2020), Melbourne (by 2022) and Perth (forecast mid 2020s) and a second airport in the Sydney basin (2026). Construction for the new parallel runway has commenced at Brisbane Airport. These projects will change how air traffic will be managed in Australia. In addition, we will also identify and introduce further safety enhancements that leverage the recent Automatic Dependent Surveillance-Broadcast (ADS-B) mandate. The initial suite of airspace management concept documents is complete and the focus now is the development of targeted plans for specific operating environments which create value for our customers. As per the Statement of Expectations, Airservices will work with the Department of Infrastructure and Regional Development, the Civil Aviation Safety Authority (CASA) and the Department of Defence in developing options for enhancing the level of safety and efficiency of controlled airspace, including at major regional airports. This initiative contributes to the performance outcomes of ‘safe and secure’ and ‘valued and accountable’ by implementing enhancements to the way we manage air traffic. The success of this initiative will be measured on the completion of the above deliverables in accordance with established budget and schedule milestones and on their contribution to achieving our key performance indicators.